Many people would assume that I’d fall in line with the status quo, be a champion of the establishment, and dutifully follow corporate policy or parrot the party line. I don’t trust people in power for a second. Power, as has been said, corrupts. I don’t trust popular opinion in the least. There is often tyranny in the majority. I don’t pick a lot of cotton in the insights of ‘experts’ on any particular subject or the proclamations of ‘pundits’ and their views on the world. 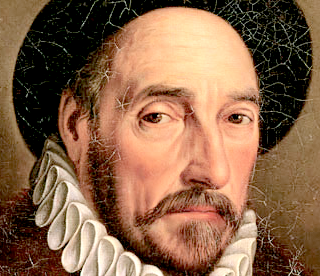 Michel de Montaigne. His “Essays” are worth a read. During my short life, I’ve discovered that the most dogmatic people are often the most well-intentioned, and the most wrong. The more perspective and information we have, the more inconclusive an issue can be, and the farther off any real solution. Still, we must endeavor to improve our own lives and our world, but there are a million shades of grey out there, and we must acknowledge the complexities and contradictions of the human condition. We must be passionate in our beliefs, but we must be circumspect in assessing their validity. So read my books and this blog with an eagerness to learn and grow, but weigh whatever I say with your own experience. I may be dead wrong about a lot of things. Don’t cut me any slack. And be suspicious of every kind of authority. The best way to live your life is to let the final decision about what is right, wrong, beneficial or harmful, truthful or deceitful, lie with you and you alone. Be slow to form your opinions, slower to share them, less confident about their absolute veracity, and open to changing them. Be patient when others are vocal and adamant about their positions. Listen and gravitate to those who offer their opinions quietly, moderately, and within a framework of historical context and polite consideration. Find or formulate a half dozen principles that you can live by and apply them as often as you can to situations in your life. Find one or two that you’re willing to fight and die for. Don’t bother drawing a line in the sand for others to see. Just stand on a rock and hold your ground. And if anything I write helps, great. Just don’t consider me an authority. I bristle at the word. Great post, Byron. Very well put. I like your observation that many people assume that you “fall in line with the status quo, are a champion of the establishment, dutifully follow corporate policy and parrot the party line.” Money can give you the freedom to be your own man or woman. It allows you a degree of freedom from certain constraints and the ability to avoid many types of enforced conformity. This can manifest as an independent streak, a devil-may-care attitude or good old fashioned eccentricity. I believe this is one of the big differences between New Money and Old Money. NMGs and OMGs have the same freedom, but NMGs are sometimes left feeling unmoored by their new found wealth, without much idea of what to do or how to act now that they no longer “have” to do a lot of the things they used to. But the upbringing and education that are so much a part of Old Money culture provide a foundation for the ability to handle this freedom responsibly and maybe even with a bit of style and grace. This is why OMGs usually appear fairly normal and conventional, but they are often independent thinkers who don’t simply go along with the latest fads or conform to group think. OMGs don’t usually look like rebels or non-conformists (except possibly for some go-to-hell pants or a rebellious phase during the teenage years) but they often have the ability to think critically and for themselves, and the financial, intellectual and emotional security to make a habit of using it. Of course, I’m generalizing, but this is something I’ve noticed repeatedly. It’s not a knee-jerk emotional rebellion against authority; it’s a healthy and rational skepticism of those who presume to tell us what to think. Again, great post! Keep up the good work in 2017! Great reply, Amy. I always look forward to your comments as well. Thank you, Bev. Happy New Year! The mark of a genius is to realize that you know nothing after a lifetime of study. King Solomon said, “all is vanity and vexation of spirit.” I, for one, despise the establishment and popular public opinion. But perhaps that is the line of thinking of all Old Money. We save our money, not for retirement, but for freedom of choice and thought. We pass it to those we love most…our families in hopes that through training and education they will do the same for their offspring. We will make the world a better place this way. The world was never made better by following orders of corrupt leaders. However, if I had one critique of your website, I would argue that you overlook one aspect of Old Money that relates to this “march to the beat of your own drum” attitude and that is the fact that a lot of old money fades pretty quickly. Not feeling able to take a high paying job because you don’t want to work for someone you can’t respect, not being interested in money, having familial tastes for the lifestyle of your parents (well made clothes, a full china set for entertaining, private school for your children, etc.) can burn up a family inheritance quickly. These are unique temptations for a family with a long history of wealth. Ikerrin, that was the main reason for the old system of primogeniture. It was so the money wouldn’t keep getting divided more and more ways down through the generations. Today, preserving the money through multiple generations is a challenge even for very large estates. That’s why you don’t see many Old Money families that are more than three generations old. I do find it fascinating that this is the case though for two reasons. First, the general rules of money are not that complicated. It really isn’t that difficult to learn that you should should diversify your investments (doesn’t even the bible suggest dividing them into 8 separate holdings which is a start, although modern portfolio theory seems to suggest 30 stocks is a better investment), live below your means, buy low and sell high, etc. Granted a modern understanding of inflation has only been available for a few generations (hence the challenge in Jane Austen books from living off “the funds” or the “5% consols” for multiple generations.). I know many people in my life who absolutely refuse to educate themselves on basic personal finance, and it’s frustrating since personal finance certainly isn’t rocket science. Second, it really isn’t that expensive to live well. The biggest expense is a home especially in popular cities like New York, Toronto, or San Francisco, but after that there isn’t that much to spend your money on. Often you get a start with some of your parent’s or grandparents furniture and jewelry. Investing in a good wardrobe can be expensive at first but afterwards you only need to add a few pieces each year. It baffles me how people can not live on $100,000 a year or even less, especially if you are helped to buy your first home. I spent pretty much my entire weekend reading your blog (I’m sure your stats will tell you how many hours). Promptly ordered your book and cannot wait to read it. It’s as though I’ve stumbled upon someone who has put to paper the niggling thoughts I’ve had about life and how to live it for a while now. I’ve written a book in a (vaguely) similar vein for young women. I hope to inspire them to look to conservative principles and values rather than run along with the destructive crowd (moralistically, materially and financially). Having not even read your book yet, just going by the blog I can tell yours will be a book I wish I’d had years ago. Thank you, Alena. The kind words about the book and blog are greatly appreciated. I just took a quick look at “Ladies Like Us” on Goodreads. Congratulations! I think we’re advocating similar concepts and I’m delighted to see that you’re reaching out to young women. I’m encouraging all of our readers to check out your book and The Darling Academy on social media. Thank you ever so much Byron, I blog over at https://www.thedarlingacademy.com – perhaps some of your readers with young daughters (13+) might be interested in the book especially? Anxiously waiting for my Amazon delivery of yours. We are self reliant, we think twice, we judge carefully …….. we think out of the box. We manage our lives and teach this to our children and grand children. We are not greedy, we are magnanimous. We sacrifice with ease, but not because we are avaricious, but because we have ability to plan to the future and we don’t have to ask authority how to do that. We understand history, arts, money, family traditions and values. We don’t need anyone’s “authorization”. Our great grandmothers and grandfathers ……. are natural authorities for us. They carefully guided their lives, planed …….. and passed the wisdom on their children, who passed it to their children. We are family people. And that’s the problem! There is a problem if you don’t rely on government – some strange people – out of the family circle. There is a problem if you don’t obey strange rules that go against your skin. There is a problem when you go and ask your father or mother for an opinion or advice if you don’t know how or what to do. There is a problem if you are not dependent on government apparatchiks. And people can clearly see it, that we are not dependent on the government. And that’s the problem! We are families and clans; and that’s against the government concept of life. We create something of value and government systematically destroys it. Government can’t create anything of value. And that’s the problem. We know how and when to redistribute family wealth to our clan members and the government hates it! Where did he learn this? At government run school? Omgm, I just finished watching the first video and it was so inspiring! I look forward to watching the second one. You’re right, that kind of creativity and imagination would be difficult to find in a traditional, paint-by-number atmosphere. Thank you so much for posting these. Byron, you ended the year with a excellent post.God bless you with your projects.